Fantasy owners might adore them, but NFL teams mostly just abuse them. By now people have recognized the trend: a running back enters the NFL as a 22-year-old. He plays four seasons under a modest rookie contract and accumulates just enough wear and tear to make the team question whether he can do it for another four years. So, instead of signing him to a lucrative second contract, they eye his replacement in the draft and let him walk as a free agent. That’s when the back learns that the rest of the NFL has similar reservations about him. Increasingly, a back must settle for a contract that’s barely better than what he got coming out of college. But there’s more to this than simple concerns about wear and tear. Given the continuous advancements in training regimens and health treatments, plus the increased popularity of running-back committees and greater emphasis on the quick passing game (which comes at the expense of the ground game), a running back’s wear and tear should be less concerning than it is. And yet the position’s value continues to drop. Not only has running back fallen to football’s fourth lowest-paid position on average in recent years, but it’s also become the position with the highest rate of undrafted players getting on the field. The draft stock for running backs has fallen right along with the position’s free-agent stock. Why? Let’s look at two free-agent backs with significant name recognition: Green Bay’s Eddie Lacy and Oakland’s Latavius Murray. Both are in their mid-20s and coming off their rookie deals. Both have had 1,000-yard rushing seasons. And both are about to find unsettlingly soft markets for their services—especially now that the Vikings are parting ways with Adrian Peterson. Some of that is due to concerns specific to Lacy and Murray. Lacy’s weight and durability are questions. Murray lacks the power typically associated with a 230-pound back. But more so, it has to do with the fact that a majority of rookies, including undrafted ones, can stylistically do everything these two veterans do. At the 30,000-foot level, there are only three types of running plays in football: outside zone, inside zone (runs that go behind north/south double-team blocks) and gap-scheme (plays that feature man-to-man blocking and pull-blockers). Many of these plays rely on factors extraneous to the running back. In other words, the ball goes where the blocking dictates. This leaves only two ways a running back can distinguish himself: by catching passes or by making defenders miss early in the down. These are dimensions that can change an offense’s identity. This isn’t to say other backs aren’t quality assets. Devonta Freeman was as dangerous as any runner in football last year. But he wasn’t creating the yards so much as he was gobbling them up behind an effective O-line. Did Freeman, with his quickness and burst, create extra yards behind his line? Absolutely. Same with guys like his teammate, Tevin Coleman, or the Dolphins’ Jay Ajayi. But the ability to create extra yards is different from the ability to create yards period. Even amongst the five “yards creators,” only two have the ability to redefine their offense’s identity: Bell and Johnson. That’s because they are cultivated threats in the passing game. Both can split wide or in the slot, which means the offense can assume any shape when they’re on the field. Bell and Johnson are special in that they’re yards creators who can play anywhere. But, creator or no creator, a running back who can simply play anywhere brings meaningful value to an offense. These are the guys who can expand your scheme. This year’s crop of free agents offers five such players: Arizona’s Andre Ellington, San Diego’s Danny Woodhead, Cincinnati’s Rex Burkhead, New Orleans’s Travaris Cadet and Dallas’s Lance Dunbar. All are capable receivers out of the backfield, in the slot or even out wide. The NFL market has not yet caught up to these backs’ true value. Ellington, Woodhead, Burkhead, Cadet and Dunbar will cost about what Murray or Lacy cost—maybe even less. But they’ll expand their new offenses in ways Murray or Lacy could not. Think of it this way: if the Dolphins were, for whatever reason, to replace Ajayi with Lacy or Murray, they’d continue to run the same plays. The new running back would simply line up in the backfield and get touches like Ajayi did. But if the Dolphins replaced Ajayi with Ellington or Woodhead, now the running back can align anywhere. Suddenly, the Dolphins are running a wider array of plays. They’ve essentially gained an extra receiver without sacrificing the runner. Sure, Ellington and Woodhead are not as powerful as Ajayi, so some eight-yard runs the Dolphins got with Ajayi might be only five-yard runs with the new guy. But you’re still able to call and execute those runs. If you were to call the type of pass plays with Ajayi that you called with Ellington or Woodhead, many of your 10- or 12-yard completions with Ellington or Woodhead would be 0-yard incompletions with Ajayi. You’re unable to call and execute those plays. Offenses are continuing to spread out and speed up. 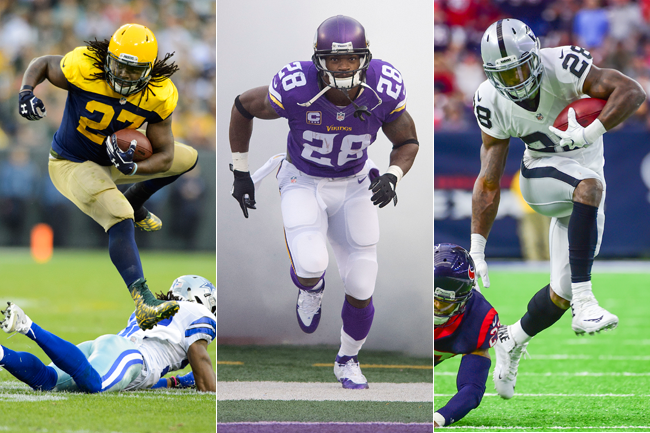 The running backs who can play to this style and pace are the ones worth paying for. The running backs who can only tote carries are replaceable. The Vikings’ moving on from Adrian Peterson is proof of it.